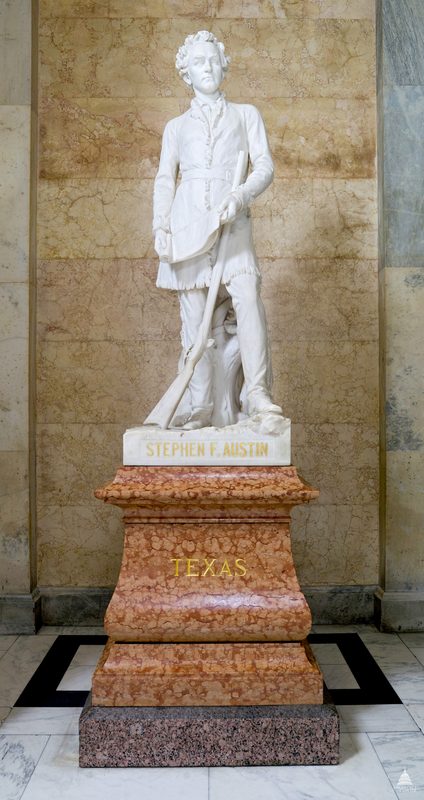 This statue of Stephen Austin was given to the National Statuary Hall Collection by Texas in 1905. The founder of the state of Texas was born in Austinville, Virginia, on November 3, 1793, and moved with his family to Missouri in 1798. He was educated at Colchester Academy in Connecticut and Transylvania University in Kentucky, and he served in the militia and the territorial legislature. In 1821 he inherited from his father a grant to settle 300 Anglo-Americans in Texas. Austin served as their civil and military leader and their liaison with the authorities. Since Austin's grant was from the Spanish rulers, he traveled to Mexico City between 1822 and 1823 to clarify their legal position with the newly independent Mexican government. Ten years later he returned to Mexico to ease tensions resulting from American settlements near the border. Because he had brought a grievance petition and a request for statehood, he was imprisoned by General Santa Anna on charges of inciting revolution. After his release in 1835, he presided at the Texas convention, which resulted in the Texas Revolution on October 2, 1835. Austin was made commander-in-chief of the army that marched on the Mexican headquarters in San Antonio, and he was later a commissioner to seek recognition by the United States, negotiate a loan, and enlist volunteers. Reluctantly he accepted the nomination for president of the Republic of Texas in June 1836 but lost to Sam Houston, who then appointed him secretary of state. Austin died on December 27, 1836, in Columbia, Texas. Download this statue's information as a PDF..